Spring is over. That was a fun 5 minutes!� We love the simplicity of a capsule wardrobe.� Many of the pieces are staples and will be worn from season to season, but it is always fun to find a few new fresh pieces to work into the basics. Do you know that Houston has a great fashion scene?� Some of the biggest fashion influencers can be spotted perfecting their Instagram pics all over town. What’s great about following local talents is that they will dress seasonally for�our season.� There is nothing more annoying than looking through magazines and seeing coats and boots when we are ready for flowy dresses, swimsuits, and espadrilles! What to wear this summer in Houston?�We’ve followed the local fashion tastemakers and picked out the trends you will want to incorporate into your style. Embroidered dresses, tops, bags – it’s everywhere and will be for the foreseeable future!� It is lovely and feminine and a great trend for summer to add some fun to your wardrobe. You need some tips on how to rock embroidery look no further than Alice at Lone Star Looking Glass. From sleeve embroidery to dresses she will rock it in a box, with a fox,�oh wait That’s ‘Green Eggs and Ham’ but either way she has some great clothes with beautiful embellishments. We’ve also spotted the embroidery trend with Brittany Fullwood from Hello Honey sported a super flattering embroidered one-shoulder dress, as well as Luxe with Kids,�Cup of Charisma,�L. Avenue, Meg O., Adored by Alex, Hello Honey, and Whatever is Lovely. Color is king and the bigger and brighter the better.� This is not going to be the season for wallflowers.� There are a lot of big, bold, bright colors going on. Dede Raad from Dress Up Buttercup is awash in color – from jumpers to dresses, to swimsuits. She is a delightful color explosion! We have seen color everywhere (Yay! ): L. Avenue, Carrie Colbert, and Irony-of-Ashi. These fun�bags are hanging around from last year though there are some fun divergences from the classic rainbow shaped ones.� You’ll start seeing round and totes and wicker and bamboo on everything! As you can see here Jillian Goltzman, from Cup of Charisma, was rocking this Bamboo bag less than a week ago and last year at The Woodlands Wine & Food Week. We’ve also spotted this bag hanging out with House of Harper,�Dress Up Buttercup, Irony-of-Ashi, Whatever is Lovely, and�L. Avenue. 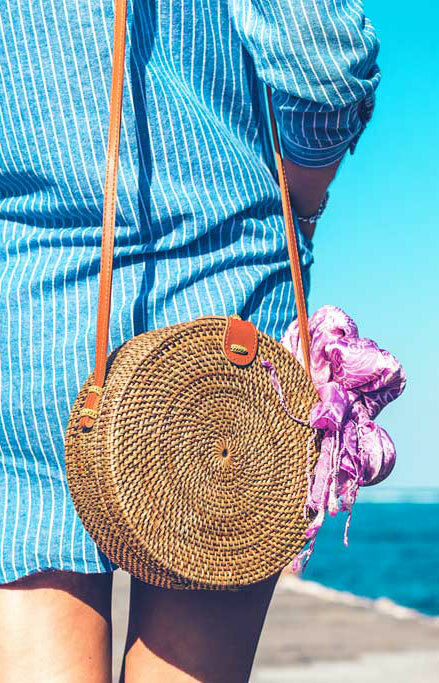 We have seen some other fun natural bags – we think round bags are going to be very popular this summer (Haute and Humid, It’s All Chic to Me, Lone Star Looking Glass). And you can’t go wrong with a classic initialed tote, like the one Alex, from Adored by Alex is sporting. Caroline from House of Harper has impeccable style and we are loving this palm printed dress with (what’s that?!) a bamboo purse (weren’t we just discussing those!?). While not a dress, Brittany Fullwood from Hello Honey nailed a fun�polka dot jumpsuit with a great color and pattern. We’ve also spotted the trend with Lone Star Looking Glass, House of Harper,�Luxe with Kids, Carrie Colbert, Meg O., Shasie’s World, and L. Avenue. Brittany Fullwood from Hello Honey found the best of both worlds with a ruffled striped dress, that has built-in shorts -�high five for active and cute moms! L. Avenue has some great ruffled looks, we love this tiered-dress and structured shirt! Everyone loves a soft comfy shirt.� Expect to see fun sayings and a lot of Houston love – and why not! These are going to be paired with ripped jeans and ripped jean shorts. Just because it’s summer doesn’t mean the restaurants have forgotten how to use the A/C.� We’ll still need our full-length jeans to make it through dinner. Or, Chick-fil-a.� Those are always so cold! Probably, so you don’t camp out and let your kids play in their glass box of awesomeness all day… Shelbi at It’s All Chick to Me�seems to have the best collection of tees! We love them all! Dress up Buttercup rocked some classic Levis, Haute and Humid loves a classic combo. And, it is a classic so you can find a variant almost anywhere we love the styling by L. Avenue, Spoiled Latina, and Carrie Colbert. Can we give a high five to whoever brought the high waist back in style?! Seriously, hugs all around for helping a momma hide some stretch marks!� In addition, there will be a return to some classic, and dare we say it, more flattering cuts. Please, let’s leave�something to the imagination! SheShe, from SheShe Show, is rocking a super flattering and brightly colored ruffled off-the-shoulder one piece by Trina Turk. It comes in several colors and Amazon has a�well-reviewed knock off! As things are heating up the swimsuits are coming out. Some fun and fashionable choices are being shared� Irony-of-Ashi�has a classic black suit;� Dress Up Buttercup has many options but we love this striped two-piece;� a fun and affordable ($15!) look is sported by Hello Honey; and, Adored by Alex. Summer is here what are your must-have summer staples? What To Wear This Summer 2018 – Cute Outfits, Bathing Suits, Prints, Purses, & More.